Squirtini is a fashion forward brand suiting Girls ages 2-15. 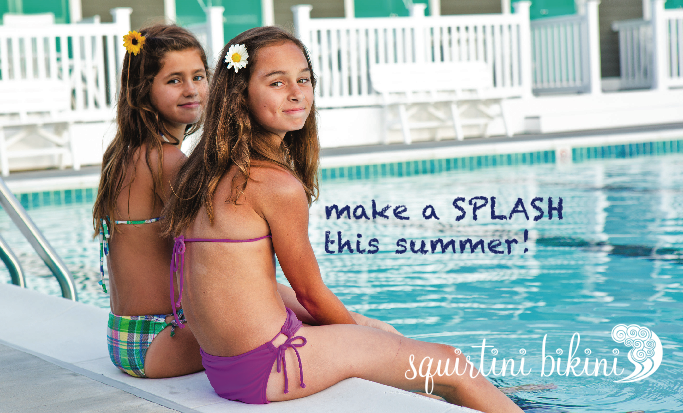 Squirtini was created to fill a void in the Tween/junior marketplace by designing age appropriate, flattering swimwear catering to a girls’ ever evolving body, mind and spirit. Each collection contains suits designed for diverse body types allowing girls to feel confident and comfortable in their own skin when making the awkward transition of going from girl to adolescent. This surf-centric brand evolved when former volley ball player and model, Farley Boyle recognized a niche market when she could not find fashionable, age appropriate suits for her 11 year old daughter who could no longer shop in the girls department due to her size. Upon being forced to shop in the adult section Farley realized that the cuts, designs and overall construction were not suitable for the TWEEN girl. Girls at this age are not looking to accentuate what they are getting nor are they secure about their bodies recent transformations. Farley designed forgiving silhouettes using minor construction to help downplay attention to sensitive areas. Squirtini’s custom fabrics contains a built in 50 SPF and feature fun, beach inspired prints like: starfish, seahorses, palm trees, flamingoes, flip flops, suns, surfboards, waves, etc. Each collection contains a bevy of vibrant prints along with solid mix-and-match separates in a kaleidoscope of colors. Girls can reincarnate drawers containing suits from seasons past with solid reversible tops and bottoms, showcasing the true fashionista within. To view the entire collection, please visit www.squirtinibikini.com or check out their social media. It might be September, but with temperatures still in the high eighties, it doesn't feel like summer is over. We live at the Jersey shore and we spend a lot of time at the beach. So we need a suit that is made to last. Squirtini had just what I was searching for. The tankini we received is a two piece that slides right on and ties in the back. I also love the beautiful design. It's hard to find stylish suits for girls without the cartoon characters, but Squirtini's designs are both mature and flattering. My daughter is only four, but for older girls, Squirtini offers a definite advantage as well. Their suits grow with girls and their changing bodies. As they start to develop, they have styles that bridge the gap between children's and adult's suits, that work with their new curves. They are fashionable but still modest, and offer the support older girls will need as their bodies mature. 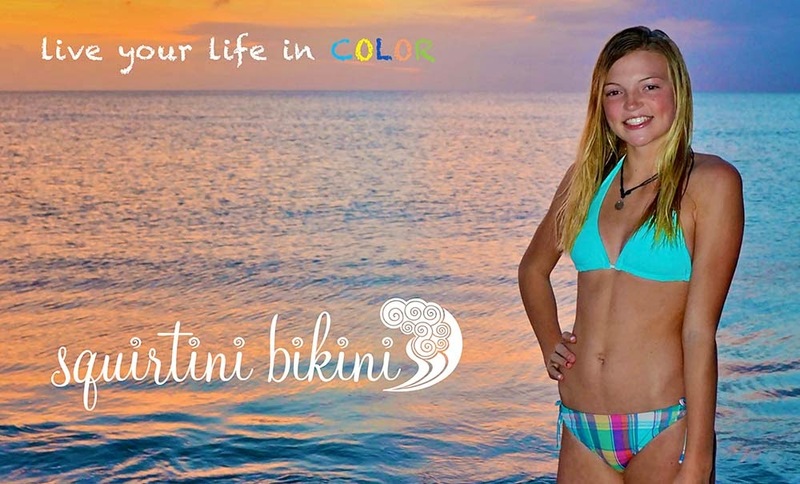 They have tons of designs including one pieces, tankinis, and bikinis in vibrant colors girls will love. There is something for everyone. If you have a daughter between the ages of two and fifteen and you've been struggling to find the perfect swimwear, look no further than Squirtini. my magnificent love to em. such an overwhelming love for em? N O T H I N G in comparison. Bangalore is a brilliant place which has different specialists and those are hold with unmistakable business close by. Bangalore escorts service are best because they are having the proper tricks as how they can make person happy. They are more adjustable in nature and take less time in adjusting. They fully attract customers with their pleasing outlook which are maintained by them on daily basis. Dear folks feeling alone then you can contact with Goa Escorts Service and Cheap rates Goa Call Girl like as Housewife, school young ladies and air lady, we are additionally given all write models in your private lodging rooms by Goa Escorts. My colleagues are from my better places similarly which also give their help of different states. We have the call young women from Mumbai who are particularly fascinating to their work, love to bait each developed men, they generally love to Goa Escorts play with rank men. Their energy is to completed the needs of people who are searching for vigorous material. These Goa call young women are absolutely pleasant for in and out stations you can in like manner make a visit to nearby spots with them to make your night enchant us, appealing and vitality fit. My hot call young women allies absolutely agree as shown by your wants.